Also called a nuclear stress test, this procedure is an imaging procedure that measures the extent of blood flow to the heart (i.e., myocardial perfusion). Our physicians use this procedure in conjunction with a patient’s stress test. It can be conducted on a tread-mill, a stationary bicycle or by infusing intravenous drugs to accelerate the heart rate. 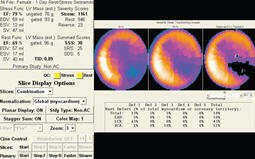 After the patient receives a small dose of radioactive tracer (thallium or technetium), physicians use a gamma camera to visualize the distribution of blood in the myocardium. Figure 1: Cardiac SPECT images of a 58-year-old man with morbid obesity (400 lbs) show no evidence of coronary heart disease. 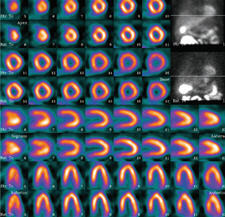 Figure 2: Cardiac SPECT images and quantification results of a 66-year-old woman with a prior heart attack show normal pump function but also evidence of reduced blood flow in a large region of the heart.